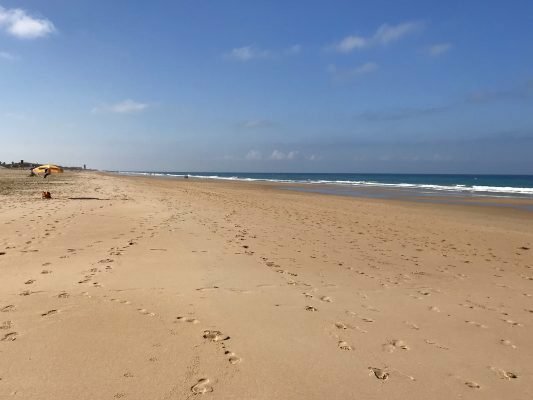 This blog post has been freshly updated for summer 2018 (you can read the original “Best beaches in Cadiz” post here) and now includes additional information on each beach including; new cafes (chiringuitos), restaurants, facilities and activities, plus I’ve added an additional beach! 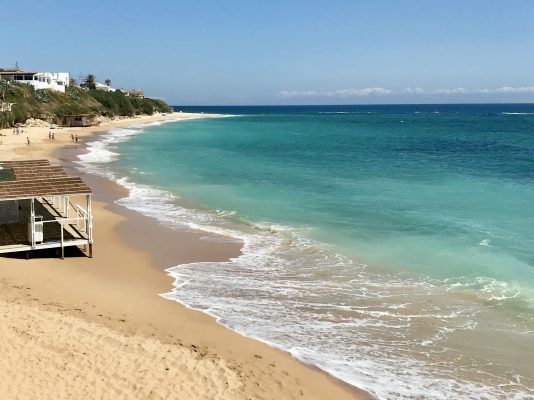 As word spreads about how stunning these beaches are, naturally they gain popularity with visitors from both Spain and overseas, however, the beaches in Cadiz are still some of the least crowded beaches you’ll find in Spain, particularly if you visit out of high-season. For Spaniards living in cities such as Seville, where summer temperatures often creep past 40 degrees, holidays by the coast are often taken in August, which can mean that towns, beaches, roads and restaurants all get very busy, something to bear in mind when planning your visit. The Costa de la Luz, “coast of light”, has months of endless sunshine and blue skies, one of the main attractions here, and a good reason why I love living in Vejer, is that we have some of the best beaches in Cadiz on our doorstep. Some would argue that the beaches along the 260 kilometres of Cadiz coastline, with their powder white sands and cool blue Atlantic waves, are in fact some of the best to be found in Spain. This a personal choice of course but if your idea of holiday paradise includes; practicing your surfing skills or cooling off in the crystal-clear waters, chilling out under the shade of your parasol with a good book, having a spot of lunch at a chiringuito (beach bar) or a picnic of delicious locally sourced goodies, staying late into the evening on the beach to watch the sunset whilst savoring a refreshing gin and tonic – all before making it back to Vejer for a dinner at one of the town’s gourmet spots and a good night’s sleep – you surely won’t be disappointed. With mile upon mile of breathtakingly stunning beaches to visit; there’s everything from near-deserted virgin sands to watersports hot-spots and child-friendly beaches, fantastic beachside restaurants and cafes with the freshest food, you really are spoilt for choice and somehow two weeks just won’t seem long enough to discover them all. 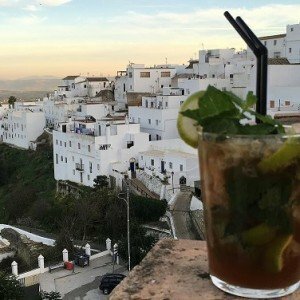 There is a summer-only beach bus which links Vejer with some of these beaches (2018 timetable) but this can be sparse and inconvenient, so my advice is to hire a car, pack a cool box, plenty of sunscreen and a beach umbrella, and follow my guide to visit some of the most incredible beaches in Cadiz. Here’s my personal selection of some of the very best beaches in Cadiz. These are not in order of preference but order of geographical location. This world-renowned, laid-back surf town is Europe’s wind and kite-surfing capital. As well as being the southernmost point in Spain, the 10 km stretch of beach which is dotted with colourful sails kites and hip beach bars is host to some of the world’s top wind watersports competitions and attracts a cool international crowd, it is probably the most famous beach in Cadiz. As you can imagine, the conditions are often pretty breezy, the hot Levante wind which blows in from the east draws huge numbers of kites and sails which can make for a spectacular view from one of the many beach bars but makes sunbathing or swimming a somewhat hazardous affair. To view some of the on-water action head to Las Lances or Valdevaqueros beaches, Chiringuito Tangana on Valdevaqueros is a popular beach bar serving up fabulous food in it’s sheltered garden area. For a more relaxing spot of swimming or sunbathing the cliff-backed beach in front of the boutique, Hotel Hurricane offers some respite from the wind and the great value buffet lunch served at the hotel is fresh, seasonal and delicious. For a little off-beach action, horse riding can also be arranged from the Hotel Hurricane. Back in the Moorish old town of Tarifa, a good beach option is the tiny Playa Chica, this is a family-friendly spot which is often sheltered from the wind. 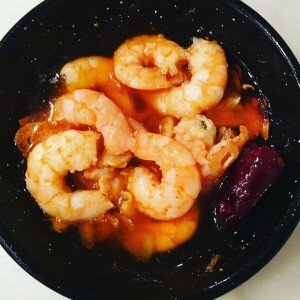 Choices for food in Tarifa old town are plentiful and often of exceptional quality, new openings offering modern takes on Spanish classics, fusion cuisine, with many vegetarian and vegan options, in addition to the well respected and very popular traditional tapas bars and restaurants. Here in the old town you might want to try the respected Bar El Frances, offering tapas and main plates, which gets busy although booking is not an option, so turn up early and put your name down for a table, unless you are lucky enough to find a spot at a barrel table outside or an inch of space at the small bar. The bright and busy, yellow-tile fronted Meson Siglo XIX on Calle Sancho IV el Bravo is hard to miss, and nor should you, the bar and restaurant has a tempting menu of tapas, sharing plates, main courses, and decadent puddings, in addition to a wine list brimming with some of the region’s best local offerings. When it comes to seafood some of the freshest local catch can be found around the port, particular favourites here include Restaurante El Ancla. 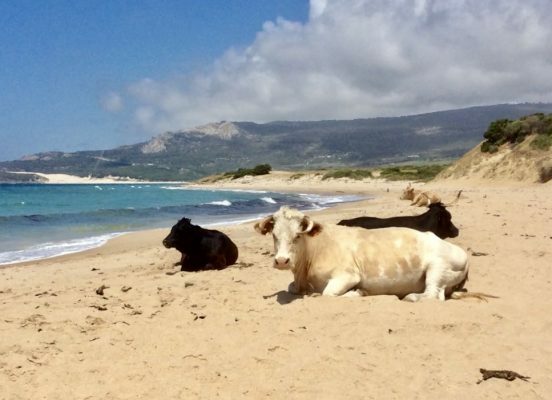 Equally as famous for its 30-metre-high sand dune (Duna de Bolonia), the Retinta cattle that are often found basking on the sand and the Roman ruins of Baelo Claudia, this secluded beach which is set far off the main road is simply beautiful. The wide sweep of golden sand can often be quite windy so it is a popular spot with wind and kite-surfers, families, and you may also encounter some nudists. There is plenty of parking, a few grocery stores and a handful of good restaurants and chiringuitos (beach bars). My favourite foodie picks at Bolonia are Restaurante Otero which is situated by the Roman ruins with a great view of the beach, the family-run Restaurante Las Rejas which is a great choice for fish and seafood, and finally local favourite – Restaurante El Albero which has delicious homemade food and friendly service. This picture-perfect, sheltered and unspoiled cove near Zahara, named the “Beach of the Germans” was so-called for being land which was donated by Franco to his allies. Playa de los Alemanes is a small but wide beach backed by a grassy slope and bookended by Cabo de la Plata and Cabo de Gracia. This native beach doesn’t have any facilities and the very little parking on the surrounding roads tend to fill up quickly in the height of the summer season. A visit here is worthwhile if only to see some of the most breathtaking beachside properties on this stretch of the coast, a cocktail of traditional Cortijo style summerhouses and impressively designed modern villas, all with incredible views onto the beach and across the Atlantic Ocean. Get here early, bring lunch and an umbrella for much-needed shade, be aware that with no lifeguards present you’ll need to be watchful of the sometimes strong currents. One of the Costa de la Luz’s prettiest fishing towns, and home to one of the four Almadraba Bluefin tuna fishing traps that are unique to the area, Zahara de los Atunes is also where you’ll find the well-appointed family-friendly beach – Playa del Carmen. 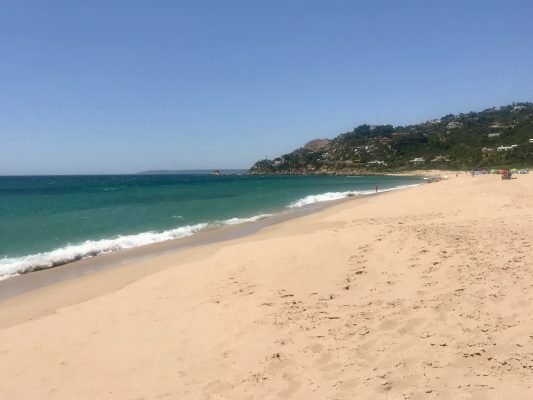 Equipped with lifeguards, a first-aid hut, public toilets and changing rooms, this wide beach is also backed by numerous restaurants and cafes so you’ll be spoilt for choice for a great lunch with sand between your toes. For one of the best lunches, in my opinion, pitch your parasol near Antonio’s hotel and look out for the local speciality ‘Atun de Almadraba’, fresh bluefin tuna, on the menu from April to June. Another good choice for food at Zahara de los Atunes is the casual beachside cafe, La Luna Chiringuito, which serves up a good selection of food and drinks, in the evening this venue hosts some great live music, a perfect excuse for staying on the beach after the sun goes down. Walk into the charming town to find plenty more food and drink options, in addition to some tempting shops. 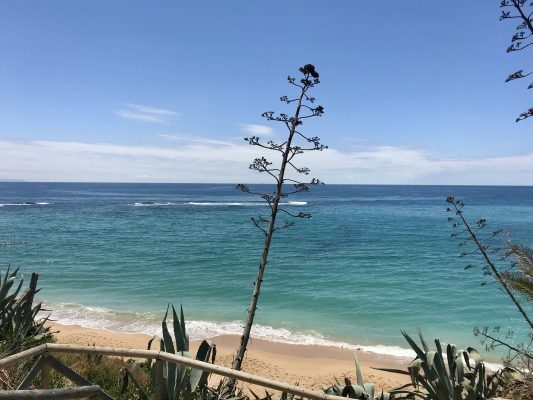 Travel further up the coast through Barbate, an important fishing town – where you could stop to visit the tasty market, drive through the beautiful La Breña national park and you’ll soon reach the laid-back bohemian village of Los Canos de la Mecca. Consisting of one road and a handful of seasonal shops, restaurants and hotels, however, if you take any pathway towards the beach you’ll be treated to the most magnificent view. Los Caños is traditionally a hippie destination and popular with naturalists so don’t be surprised if you see some nudists on one of the far ends of this beach. 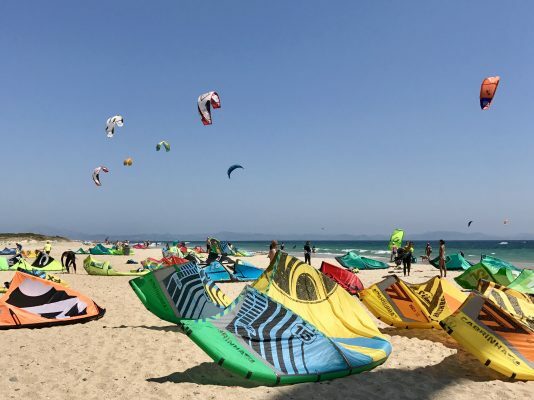 Undoubtedly one of the best beaches in Cadiz for wind & kite surfing, when the wind conditions are right you can spend hours watching the colourful sails dancing in the bright blue skies as they make their way along the beach towards the historic Cape of Trafalgar lighthouse (Cabo de Trafalgar). It was here that in 1805 Lord Nelson defeated Napoleon’s combined French-Spanish fleet so decisively from the decks of HMS Victory. There’s plenty of parking either on the street or in the seasonal car parks which pop-up from June to September. For lunch try one of the beach chiringuitos such as the gorgeous La Morena, perfectly situated on the beach for sundowners and live music. Top of my list for dinner in Los Caños is Restaurante La Brena (a short walk up from the beach) which specialises in, yes you guessed it, tuna. La Jaima is also a good spot for spectacular views and great cocktails. Sandwiched between the Cabo de Trafalgar and El Palmar is the quieter beach of Zahora. It is a little harder to reach but navigate the residential roads towards the beach and park in a car park, passing a few shops and restaurants on the way. Sajorami is a popular and busy restaurant/beach club and the patch of beach in front of it can get busy so head left of here, towards the Trafalgar lighthouse, and you’ll be rewarded with the gorgeous Chiringuito Kalima that wouldn’t look out of place on the pages of Conde Nast Traveler. This all-white Ibizan-style beach restaurant is popular and booking is recommended if you want lunch around 2pm, but you can eat from their extensive menu all afternoon. This is also a perfect spot for a gin and tonic to watch the sun setting into the sea. 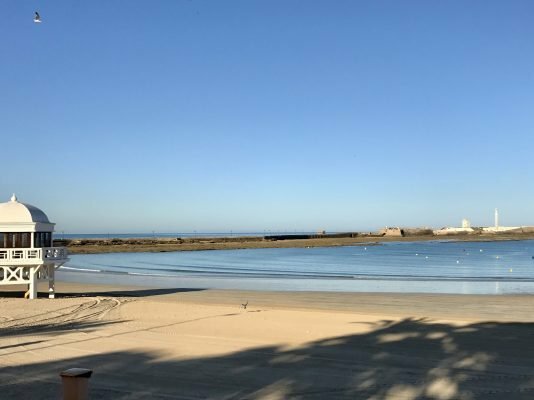 This is my personal favourite of all the beaches in Cadiz, it’s the closest to Vejer, with great facilities, activities to keep the whole family entertained, and a wonderful selection of cafes, restaurants and bars. Despite this, I really love to picnic at El Palmar so I usually set off with a cool box filled with homemade Tuna Salad and Tortilla and stop off at the BP garage at the roundabout on the way to buy delicious freshly-baked bread and cold drinks. This seemingly endless stretch of white sand is just perfect for stretching out the picnic blanket and pitching the parasol. The shallow beach makes swimming a joy but just like anywhere on the Atlantic coast the sea can be powerful, thankfully this beach is well covered by lifeguards and safety flagged. There are changing facilities, WC’s, and lots of beach showers. In case spending a day reading, swimming and relaxing in the sun doesn’t tick your beach box then El Palmar delivers on activities; you’ll find a host of things to do including; surfing, horse riding and yoga classes. Early in the mornings, El Palmar is a popular place for runners but at any time of the day you can walk the length of the beach from El Palmar to Conil and stop for a coffee or a beer before making the return journey. Stay on the beach late into the evening here and there’s a good chance you’ll be rewarded with one of the most spectacular sunsets in Andalucia, people have even been known to applaud! Eateries are endless and everyone is catered for, chose from; Spanish, Moroccan, Mexican, Indian, Thai, healthy options and vegetarian. As you’d expect, the fish and seafood are abundant and exceptional, especially when enjoyed straight from the beach with a cold beer and sand still in between your toes. There are so many places to chose from but two noteworthy venues are the long-established Restaurante Casa Francisco el de Siempre (close to the main beach road roundabout) and recently refurbished Restaurante Nacarum which is housed in a ‘Chanca’; a traditional tuna factory. Nacarum is situated at the quieter far-left end of the beach, historically this restaurant was called ‘La Chanca”. The delightful and increasingly popular coastal town of Conil boasts a number of beaches but the 2km-long beach called La Fontanilla, which has the seal of approval in the form of the 14,001 Environmental Certification and Quality Tourism Q Awards, is my top pick. This can be a busy beach in August but due to its size it never feels uncomfortable and you’ll always find a less crowded spot, especially if you arrive early which will mean you also have a good chance of finding a parking spot. 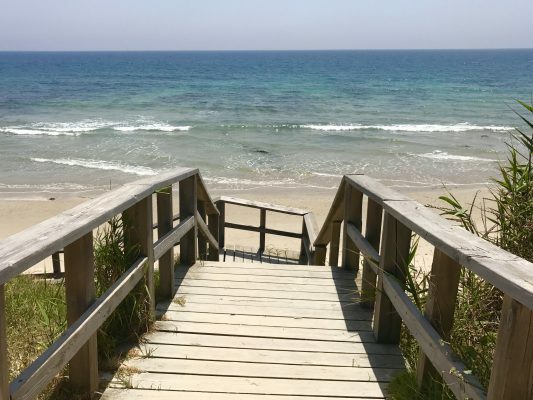 The beach is easily accessed, great for families, and can be reached from the promenade which starts in Conil, being so close to the town means there are many bars, cafes and restaurants to choose from. The best of these, in my opinion, are La Fontanilla and La Ola; the first of which is more of a restaurant and the second a beach-side chiringuito. They both are well respected for their quality of food and service, expect them to be busy in the high season. Playa La Fontanilla is probably one of the most family-friendly beaches in Cadiz due to the shallow waters and abundance of amenities available. Explore a little further afield and you’ll you’ll find the beautiful little Caletas (coves) to the west, called the Calas de Roche. This beach in Europe’s oldest city is where scenes from the James Bond movie Die Another Day were filmed. Remember Halle Berry emerging from the waves, well it was from this beach in Cadiz! It looks across to Castillo San Sebastian, connected by a walkway, which became an island in the film. This small, picturesque city beach is a perfect cooling off point from walking through the old town. Two of my favourite dining destinations are very close by, making them a perfect choice for tapas; Casa Manteca and the bar at El Faro are both worthy of a stop either before or after you head to Playa de la Caleta. The ancient town of Chipiona has long been a popular summer destination for Spanish holidaymakers escaping the city heat, but this charming Andalucian town is now gaining popularity with an international crowd and it’s not hard to see why. After spending a morning exploring the town, you can head to one of the few local beaches to relax. My recommendation would be Playa de Regla which boasts great facilities on a mostly sandy 1 km long beach. It is one of the quieter beaches in the area, backed by a promenade and flanked by a lighthouse at one end and a stunning monastery at the other. 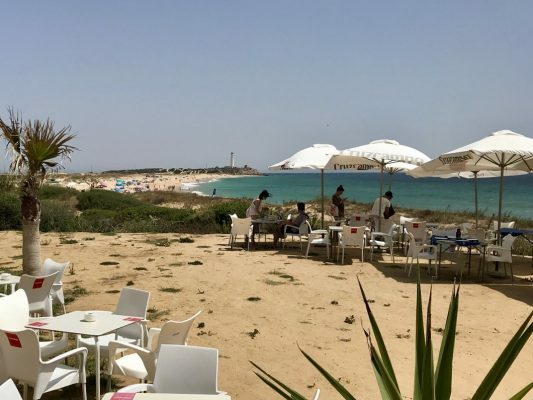 Directly on the beach near the lighthouse, you will find the chic chiringuito beach-cafe AWA, with lovely views, great food and good service. However, one of my favourite places to eat in Chipiona is Casa Paco – situated in the port, this is the best place to come for your seafood fix, everything here is exceptional so if you find yourself overwhelmed by the choice ask your waiter to recommend for you. Lying at the northern point of the Sherry triangle, where the Guadalquivir River meets the Atlantic, the elegant town of Sanlucar de Barrameda is where Christopher Columbus set sail in 1498 in search of the New World. More recently, Sanlucar can be celebrated for producing the deliciously salty Sherry wine, Manzanilla, and a visit here is not complete without a stopping off at one of the towns few surviving Sherry Bodegas. Sanlucar is also home to the natural paradise of the Coto Doñana national park; take trips from here to see its native lynx, wild boar and imperial eagles. The beach in Sanlucar is worthy of your attention for many reasons, including; sampling a plate of the town’s famous king prawns – a taste sensation when paired with Manzanilla, and watching the annual horse racing festival which takes place over two weekends in August along the 2 km stretch of golden sands. Dining options are plentiful; near the beach, one of my favourites is Casa Bigote – lively at lunchtime and with great views from the upstairs terrace, and when in town head for Casa Bilbino in the main square, Plaza del Cabildo, find a table and then order your selection at the bar. 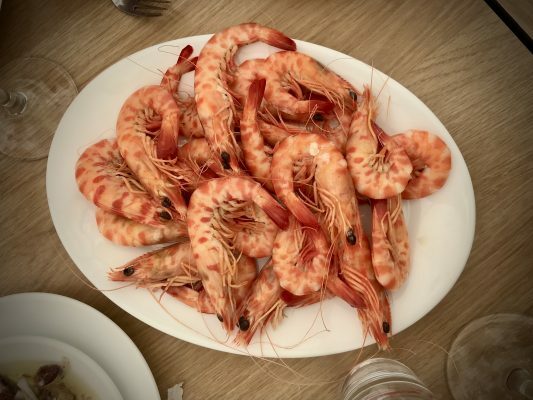 Both venues are Sanlucar institutions and will most likely be busy, but this town is full of great options so wherever you eat just ensure you order the local king prawns and wash them down with a chilled Manzanilla sherry. Join me in Spain for a truly authentic taste of Andalucia and tailor-made food & wine travel experiences.